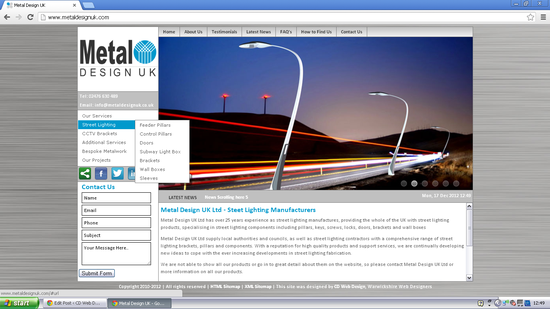 We are happy to announce that Metal Design UK, a street-lighting specialist has chosen CD Web Design to redesign and rebrand their websites. Please check at the image below to see a mock up of how their new site will look.. This entry was posted on Tuesday, November 13th, 2012 at 12:10 pm and is filed in Anything Else.., Our Latest Sites by CDWeb. Bookmark the permalink. You can follow any responses to this entry through the RSS 2.0 feed. Pinging is currently not allowed.